Smoke and Mirrors: Watch Out! Mainstream News is Reporting on Dangers of Fukushima to America! Watch Out! Mainstream News is Reporting on Dangers of Fukushima to America! The corporatized mainstream media in the U.S. does its very best to downplay the ongoing, potentially apocalyptic tragedy that occurred March 11, 2011 when a 9.0 magnitude quake crippled the Fukushima Daiichi nuclear plant, thus allowing critical information the time to be manipulated and mishandled, essentially covering up what is actually happening. The reason for this is obvious: The Fortune 500,, in particular, #8 on the list, General Electric, the primary architect of the nuclear reactors, not to mention, the overwhelming political power they wield as one of the big six media conglomerates. But as workers have begun the tricky but essential task of removing fuel rods from one of the reactor units there, a local ABC news outlet (Los Angeles CA) actually reported on the enormous danger that Fukushima poses to the USA, especially to the west coast. “Fukushima is an enormous problem that's getting bigger. Nuclear Engineer Dr. Arjun Makhijani, president of the Institute for Energy and Environmental Research, confirmed that ocean currents are carrying the radioactive water to the West Coast. "There are several hundred tons of radioactive water that are pouring into the ocean at the site every day," Makhijani said. 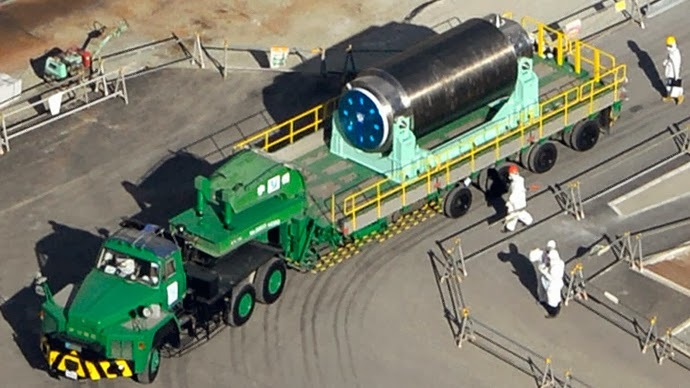 "Fukushima is potentially the biggest ticking time bomb in human history. The damaged plant is in no condition to withstand another massive earthquake or tsunami. The original 19-foot sea wall was shattered when the tsunami struck and provided little protection. The tsunami flooded the plant, cut off power, and the meltdown was underway. “Just last week, Dr. David Suzuki, one of Canada's top environmental scientists, stunned the audience when he described what will happen if a massive quake did hit today. "It's bye bye Japan, and everybody on the West Coast of North America should evacuate," Suzuki said. "Now if that isn't terrifying, I don't know what is." However, even though this report dares to go where other mainstream outlets dare not, it still distorts the facts, whether as a result of omission or commission, leaving the informed reader dubious of the author/network's intention. For instance, we're told that the radioactive isotopes will dilute, when, in fact, they are incapable of diluting, not to mention, they tend to stay within a particular, circular current that runs between Japan and the west coast of North America/Canada. Not to mention, they omit the process of bioaccumulation, how radiation exposure increases through the food chain. Radioactive particles in organisms at the bottom of the food chain are eaten by larger organisms, who concentrate it even more, and so on. Moreover, both the Japanese and US governments have increased the "safe" limits, once again, in reaction to the Fukushima meltdown. "Nuclear power plants pose an unacceptable risk to the world.. The fact that the risk hasn’t shown up often in the 55 years of nuclear energy leads some people to naively believe that all that is required to make it safe is just a little more research, better buildings, air-tight systems, and well-trained personnel, more support for university nuclear engineering departments. But no matter how many improvements and fail-safes are built into a reactor, there will always be a risk of failure — there are always material and human limitations. And when the failure does show up, the results have widespread disastrous consequences. The Japanese people have great patience, perseverance, and drive. Their country has always been prone to natural disasters and yet they have quickly recovered from them in the past. If the Fukushima residents had experienced “only” an earthquake and tsunami, they’d be well on their way to rebuilding their cities and re-establishing their businesses. I have no doubt about that. It is the threat of radiation, the problems with clean up, and the quarantine of entire areas that have made life a living nightmare for the population. The nuclear disaster has made people powerless to get on with their lives. And just think of the amount of money it’s taken to evacuate people long term and to do the clean up? The risk has shown up, and it is unacceptable.